Horizontal sliding multi-paneled units are available with an unlimited number of panels. These are extremely versatile, as units can be coupled to create large uninterrupted ribbons of sliding windows. Panels slide effortlessly within their frames, permitting easy access to outer windows without interference with existing window treatments, curtains, and blinds. Panels slide effortlessly within their frames, permitting easy access to outer windows without interference with existing window treatments, curtains, and blinds. Vertical sliding units are designed for treating traditional double-hung windows. They are ideally suited for historic structures as they are unobtrusive and completely invisible from the exterior. These units are available if no escape access is required. Or hinged for access to the exterior skylight window. Ideally suited for windows that are fixed or rarely opened. Shaped and arched fixed panel Sound Proof Window Treatments are designed to fit irregular shapes with varying angles, designs and arches. They are ideal for custom homes and historic structures. Arched windows can be merged with vertical sliding units, hinged units, lift-out units or fixed units by combining them with fixed arched panels. Lift out Sound Proof Window Treatments are available for use as side lights or over lights when easy access is desired for cleaning or maintenance to the existing exterior window. This design is available in any shape or size. Horizontal sliding multi-paneled door treatments are available with an unlimited number of panels. Although they are ideally suited for patio doors, these treatments are extremely versatile. Panels slide effortlessly within their frames permitting easy access to outer doors without interference with existing curtains, and blinds. Units can be coupled to create large or even huge uninterrupted ribbons of sliding doors. French door style treatments are available as fixed or lift-out panels as desired. 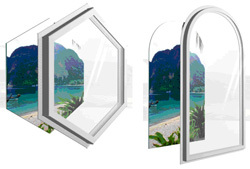 They are unobtrusive and can be installed on either side or both sides of hinged French doors. Side-light panel door/window panels are used over viewing windows. Our fixed panel design is permanently attached to the perimeter of the window opening. Side-light panels are also available as lift-out units to allow ease of removal for cleaning and maintenance of existing window. In situations where security is paramount, fixed panel designs are the most appropriate choice. 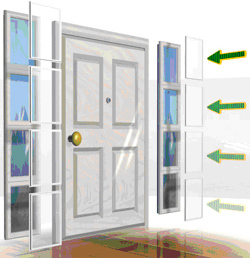 Entry-way door viewing (peep) door/window panels are used over viewing windows. Our fixed panel design is permanently attached to the perimeter of the window opening. 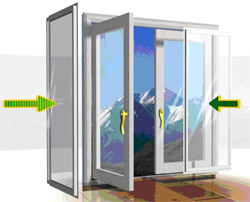 Entry-way viewing panels are also available as lift-out units to allow ease of removal for cleaning and maintenance of existing window. In situations where security is paramount, fixed panel designs are the most appropriate choice.